The world changed when the twin towers disappeared form the New York City skyline. For two Irish illegal immigrants, Taidhg and Hed, this is painfully true. they had 'good jobs' in those towers - they cleaned the windows; now they are living in a squalid room with no income. Since 9/11 'things have tightened up' and it is almost impossible for an illegal to get work. 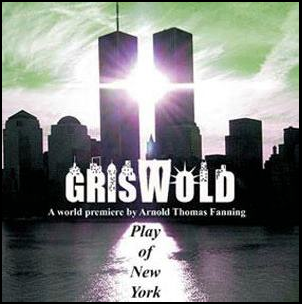 Griswold is a dark play, and in the darkness lies the humour. The relationship between Taidh and Hed is tender and savage by turns. When Taidgh refers to a 'skip' Hed corrects him: 'Over here, it's a dumpster.' A 'lift' is an 'elevator' and so it goes throughout the play. Taidhg is the tougher of the two, refusing to integrate and determined to take what he can, and if he is going to stay he has no intention of merely surviving. 'I didn't come here to be poor.' Hed knows that survival means assimilation. He has been traumatised by 9/11 but when he is forced to break out of his shell he also wants to make something of himself. What, or who, that something might be is flexible. It is a shame that Dublin's Focus Theatre had to close its venue in Pembroke Place, but it is heart lifting to see the company continue the quality of work produced by its founder, Deirdre O'Connell. The New Theatre is well suited to the kind of work this company specialises in. This production was beautifully directed by Joe Devlin, and the acting by Shane Gately and Patrick O'Donnell was riveting.